This item is expected to ship 4-6 weeks after the event on May 17, 2019. I used to play that frustrating game of chasing the pain with rehab clients. And for years I thought I had successfully treated thousands of clients with muscle and joint pain; however, I still felt as if there was one key ingredient I was missing to maintain function in my patients. Then I discovered a revolutionary method after using kinesiological surface electromyography (sEMG) evaluation. This resulted in a breakthrough in one session. I was able to free a borderline frozen shoulder and eliminated nearly all the patient’s pain – with sustained results. In my experiential training recording, I’ll show you 3 simple exercises that target the Central Nervous System to correct movement dysfunction and change your client’s lives permanently. 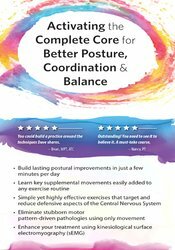 You’ll learn how to concentrate on the body’s true core and its bias – which we call the “Twist” – and discover how it leads to lasting change of improved balance, coordination, and effortless posture. These strategies will revolutionize how you work with your clients. So sign up today and revolutionize the way you treat your patients. Describe how measurable (i.e., visible) pathologies correspond with underlying muscle patterns. Connect long standing physiological principles with puzzling clinical observations. Explain the concept of dysfunctional motor patterns using long-standing physiological laws (e.g., Sherrington’s Laws, Wolff’s Law, etc.). Apply exercises which target the CNS to restore muscle inventory lost to compensation. Identify and correct defensive postural adaptation using a single integrated motion. WHAT IS THE COMPLETE CORE? The lack of outcomes in the face of all the data – what’s going on? Video and sEMG recording of test activities – what does it tell us about the body? How to use the sEMG in our work as rehab professionals? Five years after a severe back injury in 1980, David Lemke, NMT, sEMG Tech began his apprenticeship as a massage therapist in Canada. After 10 years of successfully treating thousands of pain sufferers, he had a breakthrough when information from a kinesiological surface electromyography (sEMG) evaluation led him to discover that single manipulation freed a borderline frozen shoulder and eliminated nearly all the pain – and the results lasted. Mr. Lemke eventually developed a unique model of functional assessment using sEMG. Since the 1990s, his treatment has been relied on by top performing athletes, dancers and martial artists, those recovering from orthopedic surgeries, and generally stressed individuals. As a passionate interest, Mr. Lemke has enjoyed working with select special education teachers treating motor coordination problems in children diagnosed with learning disabilities. He is a Certified Dartfish Video Coach and uses slow motion video analysis of biomechanics in athletics and rehabilitation. He has used kinesiological sEMG (computer aided muscle analysis) in testing of exercise equipment, devices, and new treatment procedures as well as trained hundreds of specialized massage therapists for physical therapy and complementary healthcare clinics. Mr. Lemke was the primary consultant to Champions Sports Medicine (Dr. P.Z. Pearce, Ironman Medical Director, Spokane, WA) in the creation of their Biomechanics lab.